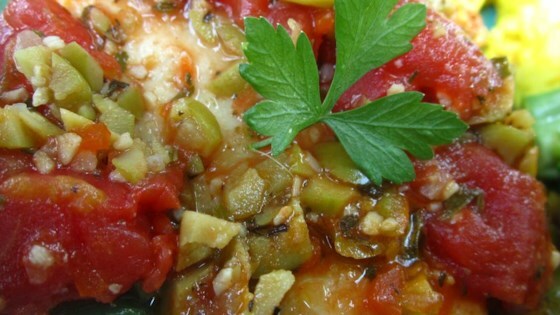 "Sauteed chicken simmered in a sauce of tomatoes, olives, white wine, garlic, and herbs. This recipe is from The WEBB Cooks, articles and recipes by Robyn Webb, courtesy of the American Diabetes Association. Preparation time: 20 minutes." Heat the oil and 2 tablespoons white wine in a large skillet over medium heat. Add chicken and saute about 4 to 6 minutes each side, until golden. Remove chicken from skillet and set aside. Saute garlic in pan drippings for 30 seconds, then add onion and saute for 3 minutes. Add tomatoes and bring to a boil. Lower heat, add 1/2 cup white wine and simmer for 10 minutes. Add thyme and basil and simmer for 5 more minutes. Return chicken to skillet and cover. Cook over low heat until the chicken is cooked through and no longer pink inside. Add olives and parsley to the skillet and cook for 1 minute. Season with salt and pepper to taste and serve. Found that there was definetly not enough sauce, and the parsley over powered it a bit. Otherwise very pleasant dish.